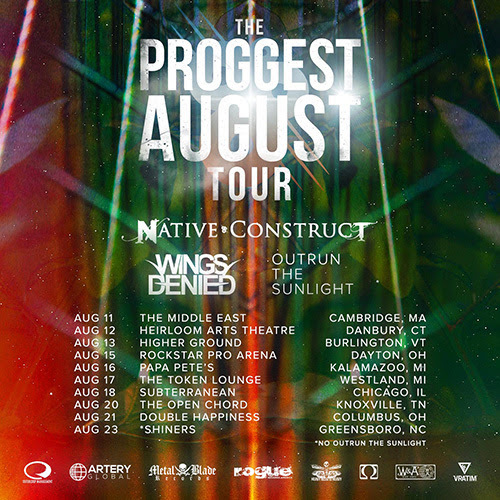 Native Construct “The Proggest August Tour” begins tomorrow! Native Construct are set to begin a headlining tour in support of their debut album Quiet World tonight. The aptly-titled “The Proggest August Tour” will include supporting acts Wings Denied and Outrun the Sunlight. To stay up to date, follow the band at facebook.com/NativeConstruct. Native Construct‘s live lineup will include fellow Berklee College of Music alumni James Knoerl (drums) and Kee Poh Hock (guitar). Both musicians can be found on YouTube at youtube.com/Ptownoldie and youtube.com/WcPh666 respectively. Also, it was recently announced that Native Construct will be performing at ProgPower USA XVI during the main show on Friday! The official announcement was posted at facebook.com/ProgPowerUSA. The sold out festival is scheduled to take place September 9th–12th at Center Stage in Atlanta, GA. Other acts include label mates Armored Saint and Falconer as well as Everygrey, Saxon, and many more. NATIVE CONSTRUCT released their debut album Quiet World in April of this year via Metal Blade Records. Quiet World entered two Billboard Charts, debuting on the Hard Music Albums Chart at #56 and the New Artist Chart at #85. Quiet World is available for purchase at metalblade.com/nativeconstruct. While there, check out music and videos from the band. And, of course, the album is available on all streaming music services, including Apple Music and Spotify.